I have about 100 rounds through my Charles Daly now and can give some first impressions. While 100 rounds is by no means conclusive, one can sometimes spot a lemon that quickly. Functioning was superb. I had two malfunctions. One was caused by a reload that was not properly crimped. It had a ring of lead around the rim of the case. It fed, but failed to go into battery. The other malfunction was caused by an after-market magazine. The magazine had no markings, but looked like a Mec-Gar. This magazine failed to feed at all. It would not feed ball. It would not even manually feed the first round. Neither malfunction can be attributed to the gun. I then tried a Wilson Combat magazine. It worked flawlessly. I will buy more and chunk the after-market magazines. I shot 230 grain ball, 230 grain LRN, 185 grain LSWC and Winchester Silvertip. Every one fed reliably, including the Winchester hollow points. The 230 grain ball shot to point of aim. The 185 grain Silvertips shot low, but centered. There was one quirk. It was necessary to manually feed the first Silvertip into the chamber without first loading it in the magazine. I do not consider this to be a problem, since that is how I always load Silvertips to prevent nose deformation caused by repeated loading and unloading of the same round. I bought some Wilson-Rogers magazines. With those magazines, the CD feeds very reliably. For some reason, it does not like Winchester Silvertips. It feeds Aguila ball and my own 200 grain SWC reloads without a hitch. I have limited tests with Federal 165 grain Personal Defense. That load had zero malfunctions. I noticed an anomaly with 230 grain LRN reloads. I had about 1200 rounds of this ammo I loaded for my Colt 1991-A1 Compact. It feeds flawlessly in the Colt. It fails to go into battery in the CD. The CD seems to have a tighter chamber than the Colt. I will try seating the bullet deeper to correct the problem. I have not done a rigorous accuracy test. Shooting offhand at ten yards, I have shot some groups that were a ragged hole. That is not a definitive test, but it does indicate that the pistol has potential. My hand did not fit the beavertail grip safety very well and was a bit sore after shooting. I have a Wilson Combat grip safety on my Colt that fits my hand better. This does not mean that the CD grip safety will not fit your hand. It only means that it did not fit my hand. I will probably wear shooting gloves if I plan an extended shooting session. I did not perform a rigorous accuracy test. I did all of my shooting offhand at ten yards. My first two shots were touching. My first offhand group was about three inches, nothing to brag about, but good enough to hit a BG in the center of the chest. As mentioned in my first post, fit and finish are very good. Upon disassembly, I found a tool mark on the barrel link. The trigger has a lot of slack, but breaks very cleanly once the slack is taken up. A 1911 style pistol in need of a trigger job is not that unusual. As many are aware of, early CD’s were of poor quality. After purchasing this pistol, I discovered that it is possible to find the date of manufacture. In the box my pistol came in, under the foam lining, there was a green inspection card. It listed the date of inspection and the name of the person who sighted the gun at the factory. Mine was dated July, 1999. It may be possible to verify the date of manufacture by looking for this tag. 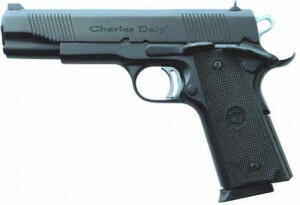 Conclusions: The Charles Daly is not a Kimber, Les Baer or Springfield. It is a very good shooter. It could be made an exceptional shooter for the price of some Wilson Combat magazines and a trigger job. Would I recommend one? Absolutely! It is an excellent value. It is a decent shooter out of the box at a very moderate price. I paid $330 for mine, but I noticed at the last gun show, the price is going up. Most of the CD’s were just under $400.